Last week I had the greatest pleasure in tasting a new gin; a well received present from Mrs Aitch. Dodd's Gin, the stuff's called; I had only been vaguely aware of it, which is not really surprising as it's a brand spanking new gin, fresh on the market. Not that you would think that from the brilliantly Victorian packaging, and the beautiful old-fashioned bottle with its wooden stopper: 'crafted by season and established in 1807'. This gin is produced by the London Distillery Company, at a traditional distillery in Battersea (just down the road from the Greasy Spoon Residence), using a 140 litre copper alembic by the name of Christina. Its organic botanicals include rasberry leaf and wait-for-it, London honey. This gin really tastes of something, it's clean and almost medicinal (in a good sense) with a strong sense of clove which cuts through, but doesn't overwhelm. But then you start looking at the price. It costs around thirty quid for a 500ml bottle. I realise, of course, that this is an artisan crafted gin, produced in small numbers (each gin has a hand-written batch number) and aimed at a high budget, connoisseur's market, but I just can't get out of my head that a 1 litre bottle of the perfectly drinkable Sainsbury's own, distilled by the distinguished old firm of G & J Greenall up in Scotland (but sold with naff Sainsbury's packaging) costs a very reasonable £15.50 (and is often available on discount, too). 'But that's unfair! ', I can hear the gin distillers cry, 'that's like comparing Teacher's blended whisky with a Knockando Single Malt'. Perhaps. But as I happen to enjoy that Old English habit of adding tonic to my gin, I'm not entirely convinced. Sainsbury's Own for the tonic, and Dodd's for the Dry Martinis, served on High Days and Holidays (including the opportunity to toast St Swithin). That might be the way forward. Nico Landenis once said: "A gin and tonic says a lot about you as a person. It is more than just a drink, it is an attitude of mind. It goes with a prawn cocktail, a grilled Dover Sole, Melba toast and Black Forest Gateau." I would like to state publicly, on record, that I adore Prawn Cocktail, love a grilled Dover Sole, and would sell my mother to get my hands on a decent bit of Melba Toast. Over the years I've had an on-off relationship with Sainsbury's. Actually, I tell a lie, scrub out the "on" bit. Back in the mists of time, probably before many of you were born, Sainsbury's had a reputation for quality. There may have even been a hint of smugness in the middle class housewife's "I bought it at Sainsbury's". I can just about remember the Sainsbury's in Gerrard's Cross High Street, used as a location in Noel Coward's "Brief Encounter"- which says it all (actually, I tell another fib, as it was nearby Beaconsfield High Street, but you will get my drift); an old fashioned shop with a Mock Tudor shop front (circa 1914), with glazed Edwardian tiles, and a meat-counter, where a butcher in white apron and straw boater (or am I imagining this?) sliced out decent bits of ham on one of those stainless steel slicing machines. So where did it all go wrong? Some might point the long finger of suspicion at Tesco's. In the 70's "Tesco Reject" was a term of mild abuse, doled out by little boys in long shorts and grubby, bloodied knees. Today, in London, if you compare the two flag-ship stores of Sainsbury's (Nine Elms) and Tesco's (The Hoover Building) Tesco's wins hands down. I'm a frequent (if reluctant) shopper at Nine Elms (purely, I admit, out of sheer laziness) and although the staff are hardworking and cheery, they seem to be constantly let down by bad stocking policies; at times, this so-called "Super Store" feels like something out of the good old German Democratic Republic, circa 1968. It's pretty tired and shabby, too. There are plans afoot to replace Nine Elms with a shiny new mega-store; part of the huge re-generation project in the area: so I'm watching this one with interest. Please don't get me wrong on this, I want Sainsbury's to succeed. I've currently got a thing about Chinese supermarkets. I like the serried rows of colourful, chromo-lithographed tins, cartons and bottles; the general abundance, the kitsch, the smell of sweet Duck fat, the fact that you can buy a steel wok for a few quid, or a lethal looking cleaver for slightly more. The brusqueness is quite appealing in a funny sort of way too- it's the diametric opposite to the hushed atmosphere of old school English establishments such as Bate's the Hatter, New & Lingwood or Budd of Piccadilly arcade- Chinese supermarkets are no place to linger, especially. There's pace in spades - and don't the shop owners let you know it? Did you see Nigel Slater's brilliantly nostalgic television programme on old-fashioned sweeties? : Life is Sweets. We got very excited this end. It brought back so many childhood memories: Spangles, Crunchies, Lemon Sherbets, Flying Saucers, Sweet Cigarettes, Jelly Babies, and Liquorice Allsorts. And then there was all that wonderful 70's chocolate advertising: "All because the Lady Loves Milk Tray", "A Finger of Fudge...", "Take a Break, Take a Kit-Kat", "Fry's Turkish Delight...The Taste of Paradise", "Everyone's a Fruit and Nutcase..." Surely, some of the greatest and most effective advertising slogans of all time? These are the ones you remember, far more than some dreary pitch about car insurance. Especially if they star irritating meerkats. Anyway, in the middle of the programme, there was suddenly a sneaky glimpse of an old Quality Street tin. You know the one- that slightly kitschy, Regency Revival thing with the chocolate nutcracker soldier and the pretty girl wearing a bonnet. And a bow-windowed shop, if I remember rightly- a bit like the Burlington Arcade in Piccadilly. My grandparents used to keep a large tin of Mackintosh's Quality Street, and we were allowed to plunge our grubby little mitts into it when we visited- and sadly, we didn't visit that often. Quality Street is now owned by Nestles, and is the best selling brand of chocolate in the world. It was invented in 1936 by Mackintosh's of Halifax and was the first box- or tin rather- of chocolates aimed at a mass market. "Quality Street" was originally a play, written by J.M. Barrie in 1901. Mackintosh then had the bright idea of using the name as a play on "Quality Sweets". Of course, all that Marie Antoinette/Regency/Early Victorian stuff was dead fashionable in the 1930's. It was very much the era of the Dickensian "Coach & Horses" Christmas Card. There was also a film with Katherine Hepburn (1937), capturing the zeitgeist. In 2000, Nestles banished Major Quality and Miss Sweetie from the tin: I am sad about that- the new tin design seems bland and boring in comparison, just like any other ordinary chocolate brand. Bring them back! The excellent Peak of Chic blog left an interesting comment on my recent post on Pink Gin. She wondered if she could buy Plymouth Gin in America? I expect she can, but I have a feeling that it's going to be more readily available from specialist shops. Plymouth Gin was the traditional gin of choice as used by the Royal Navy, and traditionally, Pink Gin was made with Plymouth, rather than London Dry gin. I read somewhere that originally, back in the 19th century, Plymouth Gin did taste considerably different from today's London Dry (it was sweeter and more aromatic); and it was also the gin of choice for Harry Craddock's Savoy Cocktail Book, first published in 1930. Since starting The Greasy Spoon (was it really over five years ago? ), I've developed an interest in package design- especially for spirit brands. I've noticed that Plymouth Gin have updated their bottle and label. I really like their new design. They've used their historical archives as inspiration, gone back to the "curves" and reinstated the friar on their label- for this I applaud them; ditching their more rectangular, modernist bottle in the process. Many brands seem to have gone for this style in very recent years; no doubt to try and appeal to a younger, cocktail bar clientele. I'm not entirely convinced. I really dislike the recent re-packaging of Mount Gay "Eclipse" rum. They've got "rid" of their charming old-fashioned bottle (reminiscent of the 50's Captain's Cabin, pirates, treasure maps, Robert Louis Stevenson and the romance of the Caribbean) and replaced it with a bland, perceivedly trendy, cocktail bar thing. Honestly, it could now be a bottle of Amaretto. Currently the routine gin of choice in The Greasy Spoon Residence. It's a classic no-nonsense gin in the London Dry manner: crisp and clean, with juniper and citrusy tastes. I've discovered that it makes a fabulous G & T when mixed with Fever Tree Naturally Light Tonic. A subtle, light and deliciously clean drink, especially when mixed with a slice of lime. Founded in 1761, G & J Greenall is one of the older distilleries, which also happens to make the perfectably drinkable and reasonably priced Sainsbury's own brand gin. They also distill Bombay Sapphire. Personally, I find Bombay Sapphire a bit too sickly and floral for my taste; originally aimed at the 80's cocktail crowd- the sort of people who added cherries to their drinks, wore Hawaiian Shirts with Ray-Ban wayfarers and approved of cocktail umbrellas. Greenall's have very recently redesigned their packaging, presumably aiming the brand at a younger market. Gin's suddenly hip again! But of course! Gin never went away, did it? This time round, I like the clean lines of their new look, and the rather Forties looking- and very British- typeface. Many of you will know that I am a huge fan of Lea & Perrins; indeed, "The Greasy Spoon" has almost become a tribute website to the stuff. "Tomato and Worcester Sauce" is their latest sensation. I'm not entirely sure about it: it's a bit like a pair of co-respondent shoes or a variegated shrub- it can't make up its mind whether it's Worcestershire sauce or Heinz-style tomato ketchup. What does it taste like, I hear you ask? Well, either like Worcestershire sauce with a dollop of tomato ketchup, or tomato ketchup with a dollop of Worcestershire sauce. A sort of British version of American barbeque sauce, without the hickory bit. A few days ago, Mrs Aitch treated me to a superb lunch at The Boundary- currently my favourite number one restaurant. I would love to know how they made their Bloody Marys. They were sweeter in taste (sherry and lemon juice? ), spicy and dark red in colour. I've got a sneaky feeling they may have added a significant dash of Lea & Perrin's new sauce. It's the sort of thing they're selling in the Albion Food Store, which can be found on the ground floor above the restaurant. Recently, I seem to have reverted to my former tipple of choice, The Gin and Tonic. Our hovel is in danger of becoming a temple to the stuff. As I regretfully say farewell to the years of late youth, I seem to be turning into an updated version of my father. My father was- and is- a creature of habit, and back in the early 70's, come hell or high water, every Saturday morning was spent in ritual fashion, stocking up on Victory Gin from Victoria Wine, and a bag or two of spicy Bombay Mix. Own brand gins are not to be sniffed at: I've started to drink the excellent and extremely affordable Sainsbury's London Dry Gin, which I can see from the small print is actually distilled by Greenall's up in Warrington (where, incidentally, Bombay Sapphire is made.) It's a clean, light and rather subtle gin and comes highly recommended, although I'm not that happy about the new packaging- until a few weeks ago, it came with an amusing 18th century black and white engraving of St Paul's Cathedral, London Bridge, and the spires of Old London Town. This has now been relegated by some trendy packaging consultant to a small, over-stylised motif in the left hand corner of the label. Any serious gin drinker will know that the different brands vary dramatically in taste. Bombay Sapphire for example, is highly scented, and in my opinion, slightly too sweet, even a trifle sickly. The brand, too, is not as ancient as the label suggests, and I'm guessing that it's deliberately marketed at a younger metropolitan crowd. Tanqueray Export is popular in America and with its higher alcohol content is excellent for a Dry Martini. Beefeater is a smooth and crisp gin which consistently wins approval in blind tastings, and is reasonably affordable. I'm a huge fan. I suppose that my interest in gin derives from the days when my father used to advertise Booth's Gin. Booth's was the gentleman's gin, founded in London around 1740, and a favourite, if it is to be believed, of both Her Majesty the Queen, and Her Late Majesty, Queen Elizabeth, The Queen Mother. Strangely, "Booth's Finest London Dry Gin" was actually yellow in colour: I seem to remember some story about how the straw in the wooden barrels turned the gin yellow by accident; a tradition which Booth's maintained until the demise of the company in, I suppose, the mid 1980's. "Booth's High and Dry" (which came in a lovely frosted bottle, a splendid heraldic red plastic lion on a "silver" chain around the neck) was the gin of choice for the connoisseur of the Dry Martini. As you've probably realised by now, Booth's panelled offices in Park Lane closed their doors for the last time some years back, and the brand was swallowed up by one of the corporate Big Boys, who allowed it to fall into obscurity. There is a gin calling itself "Booth's London Dry" (in a blue plastic bottle, but with the famous red lion) which seems to be still available in the United States, but I read somewhere that it's actually distilled in New Jersey, and I suspect that it has no authentic connection with the original British brand. I really don't know. It's all a terrific shame: it would really make my day to see those suave frosted bottles back on the shelves once again. Anyway. I digress. What's the best way to serve gin? The classic gin and tonic is an excellent (and under-rated) drink, and I hate to admit it, not often served properly (and that includes by yours truly himself). Nothing worse than warm gin in one of those cheap hotel glass tumblers with a white line on it, and a limp lemon slice floating around in it. Ideally, the gin needs to be chilled in the 'fridge, and then poured into a clean tumbler over fresh ice cubes. Schweppes make a classic tonic, though I also happen to like the taste of Britvic (founded in the mid 19th century as the British Vitamin Products Company). It's quite a good idea to buy those small cans of tonic which keep fizzy, as tonic kept in those plastic screw-top bottles tends to go flat. There are some very strange people out there who claim that a slice of cucumber works well in gin. I reckon that's a complete aberration, and am of the firm belief that a slice of lime is your best bet, with lemon coming up from behind in a close second. Piccalilli is one of those slightly weird British "delicacies"- if that's the right description. Frankly, the stuff's almost radioactive; it's bright yellow in colour, and potently acidic; utterly out of fashion too, evoking the world of Austerity Britain: all the glamour of Dad's allotment, prize marrow competitions and Brown Windsor soup. First prepare the vegetables. Break up a small cauliflower into small florets, peel a cucumber, de-seed it, and chop it into small cubes. Finely chop up two onions. Place the vegetables in a bowl, sprinkle them with salt, and leave to stand overnight. The salt will draw out lots of water and help to keep the vegetables crisp. 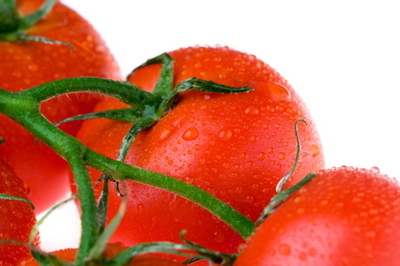 Pour off the water, rinse the vegetables with cold water, and pat them dry. When you're ready to make the piccalilli, get hold of a large preserving pan and pour in about 500ml of cider vinegar. Add 250g of sugar and the following spices: a dollop of Colman's English mustard, turmeric, ground ginger, ground cumin, mustard seeds, chili flakes, nutmeg, and a pinch of cayenne pepper. Warm it through until the sugar dissolves, add the vegetables and then bring the mixture to the boil. Season with chunky black pepper, reduce the heat and simmer away for about ten minutes. It's unlikely that you'll need to add any more salt, as you've already used it at the beginning of the recipe. The turmeric and mustard will turn the mixture a bright yellow colour. Finally, thicken up the piccalilli with some cornflour: in a separate bowl add some of the cooking liquid to a tablespoon or so of cornflower and whisk it up until it forms a paste. Reduce the heat and slowly mix this paste into the piccalilli. Simmer for a further five minutes (until the cornflour is cooked properly) and then decant into sterilised jars. It will need to mature in a dark cupboard for about a month before use. 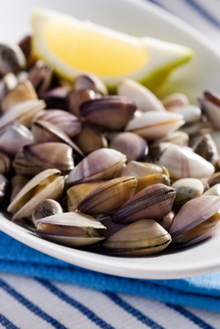 Excellent with cold beef and oily fish such as mackerel and herring. After all this talk about finger sandwiches, Eton Mess, and avocados, it's time for something a bit more robust. I've got a secret yearning for sweetcorn relish. 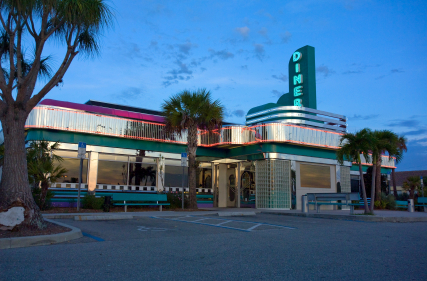 It's American white trash, diner food at its best. Bick's, the Canadian brand, does a great range of "relishes" and I love the retro packaging, too. A few days ago, I decided to create my own sweetcorn relish, in true diner style. It worked well, and was similar to the stuff you buy in jars. Here's how I made it: First, I chopped up some shallots, and cooked them in oil. Next, I tipped a tin of sweetcorn into a bowl, and mixed in some green and red peppers (chopped into tiny cubes), a splash of white vinegar, a spoonful of sugar, a teaspoon of garlic powder; seasoned it with sea salt and pepper, and finished off the job with a spoonful of starchy cornflour. I added the cooked shallots to the mixture and heated the thing slowly in a small pan, so that the cornflour cooked properly. The finished result was pretty darn authentic. For extra heat, you could also add some red chilis, sliced very thinly into strips- I hesitate to use the French term julienne, as in this case, it just doesn't seem appropriate. Perfect with burgers, even better with fried chicken. Nothing can be more reminiscent of a British Greasy Spoon than a bottle of H P Sauce. H P Sauce was invented by Frederick Gibson Garton, a grocer from Nottingham, in 1896. He named his tangy new concoction after the Houses of Parliament in London. For years H P Sauce was made in a factory in Birmingham, but now- shock horror- the stuff is made in The Netherlands. What's it made of? Well, amongst other things, Malt Vinegar, Dates, Molasses, Onion, Tamarind, Garlic and Mustard Flour. The rival brown sauce, Daddie's Favourite, was launched in 1904, and, apparently, is still in production, though I haven't seen a bottle on the shelves for years. Both brands are now owned by none other than our old friend, Heinz. Brown Sauce is an acquired taste, and I suspect that anyone not born on the Perfidious Isle is probably going to hate it. Personally, I have a nostalgic thing about the fruity combination of brown sauce mixed with a runny fried egg. But then, our American cousins eat peanut butter and jelly sandwiches, which sounds to me like something from Planet Nine. Enough said. I know there are other brands on the market, but for me, tomato ketchup has to be Heinz tomato ketchup. In 1801, a recipe for tomato ketchup appeared in an American cookbook, the Sugar House Book; and by 1837, an enterprising character, Jonas Yerks (great name!) was selling it across America. F & J Heinz first marketed their version in 1876. What's in it? Well, tomatoes (obviously), vinegar, salt, allspice, cloves, and cinnamon. I've tried to make it at home (by reducing tomatoes, adding a bit of sugar and some decent vinegar), but although the results have been reasonably good, I still prefer the famous stuff in the bottles. Oh- and I miss the glass bottles. I know that the new plastic squeezy ones are much more practical, but there was something wholesome about the old classic glass bottles- even though you had to turn them upside down to get anything out, and then suddenly all the ketchup would be over the floor. Why the 57 Heinz varieties? It was an original slogan of the H. J. Heinz Company of Pittsburgh; used as a marketing tool. Although the company had more than 60 products in 1892, the number 57 was chosen because the numbers "5" and "7" held a special significance to Mr Heinz. In a later post, I'm going to have a look at two British classics: HP Sauce, and Daddie's Favourite Sauce- two variations on brown sauce made from molasses. I have a feeling that Daddie's is now defunct. Put it this way, I haven't seen a bottle on the shelves for a long, long time. The world is becoming too sophisticated, by half. As I wrote about Hungarian Goulash the other day, I thought it would be an excellent time to investigate paprika. Paprika was unknown in Europe until the discovery of America. It's made by grinding up dried red chili peppers to form a colourful powder and is used in the cooking of Eastern Europe, Spain, Portugal and The American Deep South; where they cook interesting dishes like Paprika Chicken and Sour Cream. Hungarian paprika comes in all sorts of shapes and sizes: Eros (Hot), Rozsa (Rose), Csemegepaprika (Exquisite Delicate); and there are also smoked varieties for increased flavour. Here in jolly old England, it can be hard to find the better brands. For years, we've been used to buying our paprika in little glass jars from the supermarket spice rack. Out of sheer laziness on my part, I used an old jar of this the other day, and my goulash turned brown, and didn't taste that great- so be warned. 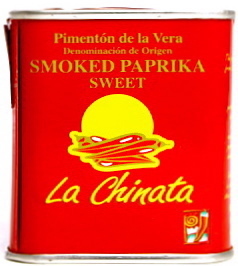 But if you have a look in the deli sections, you may well be able to find decent Spanish smoked paprika. It comes in small tins. I'm currently using the "smoked and sweet" version for my goulash, but in theory, I should be able to find "bitter sweet" and 'hot". One of the advantages of the recent influx of East Europeans into London is that Polish food is beginning to creep onto supermarket shelves as a matter of course. I was down at my local corner shop yesterday, and there were curious jars of pickled sausages and sauerkraut, and God knows what else, in a newly created section. I realise that there are less Hungarians here, but it would be lovely to see proper Hungarian paprika making an appearance too. Otherwise, it's going to have to be a trip to the new Wholefoods Emporium in Kensington High Street. There are various types of salt. Most table salts are refined and probably obtained from rock, and the refining process involves chemicals and other nasties. Sea salt is derived from the evaporation of seawater by sunlight. Fleur de Sel is an expensive hand-harvested sea salt found in Brittany and the Camargue. One of the most delicious salts on the market is made by Maldon in Essex. The company's been around for a long time, and they produce their natural sea salt from the flat salt beds of the East Coast of England. Maldon salt looks slightly unusual and has a different taste too. Instead of crystals, there are flakes; and the salt has a natural, sea-sidey taste that melts on the tongue. If you haven't switched to Maldon yet (or a similar traditionally made salt), please do- because it will make a genuine difference to your food. I promise. I've been looking forward to writing about gin. I suspect among the younger hip crowd, gin is considered slightly old-fashioned and fogeyish; and there's now a general gravitation towards vodka in cocktail bars and night-clubs: how many times have I heard some blade, or party girl for that matter, ask for a Vodka and Cranberry Juice? Anyway, back in the good old days of wife-swapping, bridge parties, and twiglets, gin was the tipple of choice, and, of course, the basis of, perhaps, the greatest of all cocktails, The Dry Martini. But more about that in a later post. Gin was invented in the Netherlands in the 17th century, and was distilled from barley. London Dry Gin is different. It's made from a neutral grain spirit, and then re-distilled after botanicals have been added; and the most important botanical, which it gives it that particular taste, is juniper. What's fascinating about gin is how the different brands vary in taste. It's because of the wide range of botanicals that can be used, ranging from lemon peel, anise, angelica root, coriander, cinnamon, to cassia bark. For a standard gin and tonic, I happen to like the 40% proof Beefeater; 94.6% proof Tanqueray for a Dry Martini, and Plymouth Gin (the sailor's choice) for Sloe Gin- if and when I ever get around to making it. It may surprise you to know that Bombay Sapphire- that's the gin in the lovely blue coloured bottles with Queen Victoria on the front, is a relatively recent newcomer to the market. It's slightly sweeter, highly flavoured with botanicals, and deservedly successful. In the eighteenth century, the government allowed gin to be distilled without licence, and, consequently, the ale-houses and taverns were flooded with cheap gin, which was, in effect, fire-water. Underneath you will see a picture of "Gin Lane' by William Hogarth. Actually, if you know the Leicester Square area of London, I'm not sure that a great deal has changed since then, except it's now beer and bizarre cocktails mixed with Red Bull which is causing all the excitement. What can be more British than Marmite? To my American readers, Marmite is a thick, dark, tangy, rich and glutinous mess that you spread on your toast, typically at breakfast or perhaps as a late night supper snack. 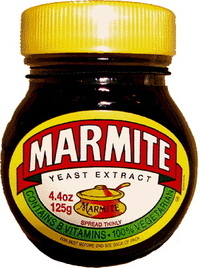 For years I assumed, wrongly, that it was some sort of meat derivative, but Marmite makes the stuff from brewer's yeast, and so in theory, it's suitable for vegetarians. The Marmite Food Extract Company was founded in 1902. Some clever spark realised that you could manufacture an edible savoury paste out of the waste yeast used in beer making. The Edwardians were heavily into these yeast extracts ( Bovril being another example, but with the addition, shock horror, of beef ); one reason being that you could make up a cheap but nourishing bouillon with the simple addition of boiling water. As you gourmands all know, the word Marmite means a pot or casserole in French, and that's why the cultish jar is shaped, er- like a marmite. And now ( trumpet fanfare, gasps of amazement ) there's new limited edition Guinness Marmite. It's got Guinness in it! I am dying to try it, but it seems to have sold out across the nation, and the supermarket shelves are bare. There seems to be a dubious trade in the stuff on eBay, but I have yet to bring myself to fork out the obligatory ten quid or so required to get hold of a jar. 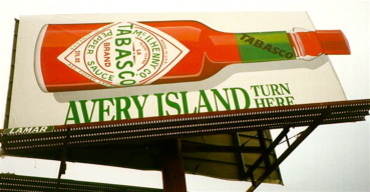 The famous McIlhenny company of Avery Island, Louisiana, has been producing their inimitable Tabasco pepper sauce for five generations. According to legend, the bottle shape was derived from the original cologne bottles used by Edward McIlhenny in 1869. Until recently, they made the sauce from peppers grown entirely on Avery Island, although these days, the company sources peppers from Central and Southern America. I've recently started using the subtle green jalapeno version, and have to admit that it's currently my number one choice, which, no doubt will brand me as a Tabasco heretic amongst die-hard Tabasco aficionados. For some reason, the green sauce is incredibly hard to find in Britain, and most supermarkets don't seem to stock it; but my local corner shop in Battersea, bizarrely, seems to have an inexhaustible supply. In a later post, I'm going to look into Louisiana Gumbo, that wonderful stew of meat, shell-fish, onions, celery and bell-peppers. Several gumbo recipes call for a liberal dash of Tabasco; and in a grey, and often uninspiring world, that's a marvellous thing. I remember as a child being taken by my grandfather to the now sadly defunct London Steak House, and being especially impressed by a fawning waiter, no doubt in an egg stained maroon mess jacket, offering me a suave choice of English, German or French mustard. And, when you're ten years old, that's a big deal. Colman's of Norwich make one of the most famous brands of mustard. Founded by Jeremiah Colman in 1814, it's a classic English mustard with a deep yellow colour, tangy taste and powerful kick. Connoisseurs of the brand reckon that the best version is Colman's mustard powder, which you mix up with water, and then leave for about twenty minutes to bring out the oils and for the full, robust flavour to develop. I'm also fond of the classic all- American French's Mustard, which has as about as much to do with France as the Empire State Building. Created in 1904 by Robert Timothy French, this is a creamy, bland mustard, which is similar in some ways, to milder German varieties. Let's start with a look at the iconic Lea & Perrin's Worcestershire Sauce. In effect, it's a fermented fish sauce. I read somewhere about a nauseating Eskimo delicacy. They would make a large hole in the ground, chuck gobbets of raw fish down there, relieve themselves all over it to get the fermentation going, and then dig it back up again after a month or so. Sounds good, eh? The British version was first sold by Mr Jon Wheeley Lea and Mr William Henry Perrins in 1838, from a family recipe given to them by a Lady Sandys, recently returned from India. They were a pair of enterprising, and no doubt, bewhiskered chemists from Worcester and their world famous sauce is still made at the old Worcester factory, close to the Malvern Hills; although the company is now part of the French food conglomerate, Danone. The "original and genuine" stuff is made from malt vinegar, molasses, sugar, salt, anchovies, tamarind extract, onions, garlic, flavourings and salt; although the American version uses distilled white vinegar and has a slightly less rich flavour. And it's an essential ingredient in two all-time American classics; the Bloody Mary Cocktail, and the Caesar Salad.